What’s the number one challenge of running a print shop or internal central reprographics department (CRD)? With the industry transitioning from long-run static offset jobs to more short-run complex digital jobs often requiring variable data printing, many would say managing workflows to improve efficiency. Those complex jobs often involve mixed media, multiple data sources, brand accurate colors, in-line finishing, and combining color and monochrome pages. What’s more, you need to produce them for both print and digital use. And your turnaround times are shrinking as well. 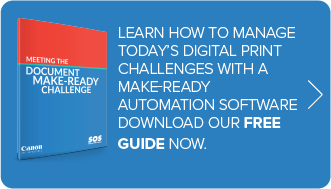 From job receipt through preflighting, to make-ready, proofing, and production, the many steps can hamper productivity, add costs, and increase complexity. As a result, your workflows end up becoming more and more inefficient with far too many touch points that slow down the process. Does your digital press workflow reality look like this? If so, here’s how you can take back control, eliminate bottlenecks, reduce costs and speed your job turnaround times. Take a look at solutions from the industry leader: Canon digital press automation. Canon digital press automation tools solve these problems by integrating advanced make-ready tools into one modular system with a consistent, easy to use interface. The software is designed to simplify processes and eliminate those time-consuming touch points with efficient end-to-end automation. Because it’s modular, you can implement tools to add capabilities as your operation grows. Using Canon digital press workflow solutions, you get streamlined process from composition through production. Seven make-ready essentials built into Canon PRISMAprepare software allow you to customize the order of tasks and automate those tasks by creating and applying templates for improved productivity. Automation templates and hot folders make it quick and easy to prepare repetitive jobs, reduce mistakes and maintain consistency. Implementation of Canon’s suite of tools is just as easy, with the experts at Superior Office Systems to configure your system, train your staff, and maintain your equipment for maximum reliability and efficiency. Ready to learn more about how Canon’s automated make-ready solution can streamline your operation? Read case studies and learn about the power of automated workflows in this informative guide: Canon Press for Success: Meeting the Document Make-Ready Challenge.